September 1, 2013 Cairo Egypt’s chief prosecutor ordered former president Mohamed Morsi and other Muslim Brotherhood leaders on Sunday to stand trial on charges including inciting murder, the state news media reported. The order seemed to extinguish hope of a political resolution that would bring the Brotherhood out from underground and back into the political process. The authorities, who allege that Mr. Morsi stoked deadly clashes outside his palace in December, did not detail the evidence against him on Sunday. There is no public record of statements he may have made to incite violence. Since Mr. Morsi was deposed on July 3, setting off protest rallies and sit-ins across the country, the authorities have killed more than 1,000 of his supporters and jailed much of the Brotherhood’s senior leadership. The former president himself had been detained without formal charges since his overthrow. The developments on Sunday seemed to close off any chance for an imminent settlement to the standoff between the Islamists of the Brotherhood and the military, and marked another confounding turn for Egypt’s chaotic political transition. As the country has lurched between military rule and fledgling democracy, its judiciary has remained marred by politics, one of many lingering remnants of Egypt’s authoritarian past. The timing of the prosecutor’s order reinforced that feeling: Mr. Morsi, Egypt’s first democratically elected president, was charged with capital crimes 12 days after his autocratic predecessor, Hosni Mubarak, was released from prison, though he remained under house arrest as he awaits a second trial on charges of complicity in the deaths of hundreds of protesters. Our predecessor publication had reported in September of last year on anti-Semtic and other extremist statements made by Dr. Morsi including a 2004 statement in which he said that the “Quran has established that the Jews are the ones in the highest degree of enmity towards Muslims” and that “there is no peace with the descendants of the apes and pigs”. The U.S. government subsequently asked Dr. President Morsi to repudiate those comments which he said were taken “out of context.” In January of this year, Forbes ran a piece documenting that we was the first to report on Dr. Morsi’s anti-Semitic statements. 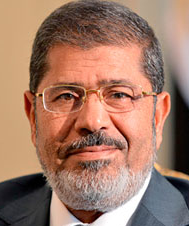 For a profile of Dr. Morsi, go here.